Augmented Reality: Fad or future? 3-D technology is seeing a resurgance in theaters, with new films trying to improve the technology and bring more viewers into theaters, and online marketers are starting to experiment as well. A new technology called augmented reality (or AR) lets consumers play with hologram-like images through their web cameras. Brands are beginning to integrate the technology into their online marketing campaigns. and view an animated, 3-D 1972 Camaro on screen. The Camaro is relevant to Papa John’s because it is the car that the company’s CEO, John Schnatter, sold in 1984 to start his first pizza place. It also coincides with a cross-country trip Mr. Schnatter is incorporating into the company’s larger marketing strategy. The technology is sure to impress a few pizza customers, but once they use it, are they going to come back for more pizza? It depends on how well companies integrate AR into their marketing strategy. USPS’s strategy has the benefit of being useful. And promoting the company’s tech savy in a market that is increasingly being squeezed by companies like FedEx and UPS. And GE has seen a boost from their AR attempts. Their campaign focused on finding new forms of energy. 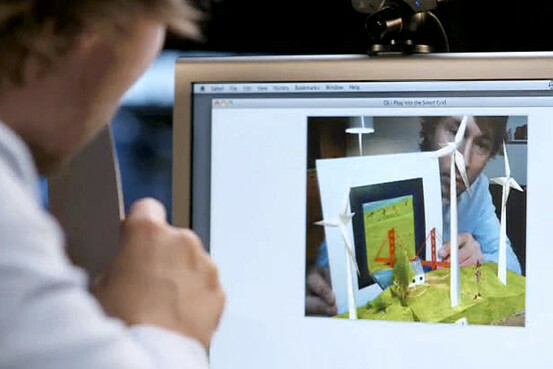 Their AR image showed a 3-D wind farm with three wind turbines that viewers could interact with. More than one million visitors have gone to GE’s Eco Smart Grid site since it launched in February, and over 25% of them spend more than five minutes on the site. Papa John’s hopes to integrate coupons and special discounts into its AR campaign, and its success there depends on how useful consumers find their attempts. AR allows for a new level of engagement that brands are craving. While only about 18% of the nation’s 68.5 million broadband households have web cams according to Parks Associates research firm, that number is quickly rising. If brands use AR in smart ways, the usability will get there.